I have not heard of Nyonya Colors, until it opened at The Gardens, near the connecting bridge from Gardens to Mid Valley. But of course when one, googles Nyonya Colors, the results come back with a lot of Nyonya Colors 1 Utama hits, and links to very prominent floggers too. It was just one of those evenings, you walk around Mid Valley, trying to decide what to eat. Nyonya Colors, as I saw it, gave me the impression of just another Kopitiam in an up market area like The Gardens. Anyways, we walked in one evening, and ordered this Pandan Nasi Lemak bungkus. I immediately loved the taste of this little packet of Pandan Nasi Lemak. The rice is aromatic, and doesn't stick to each other. 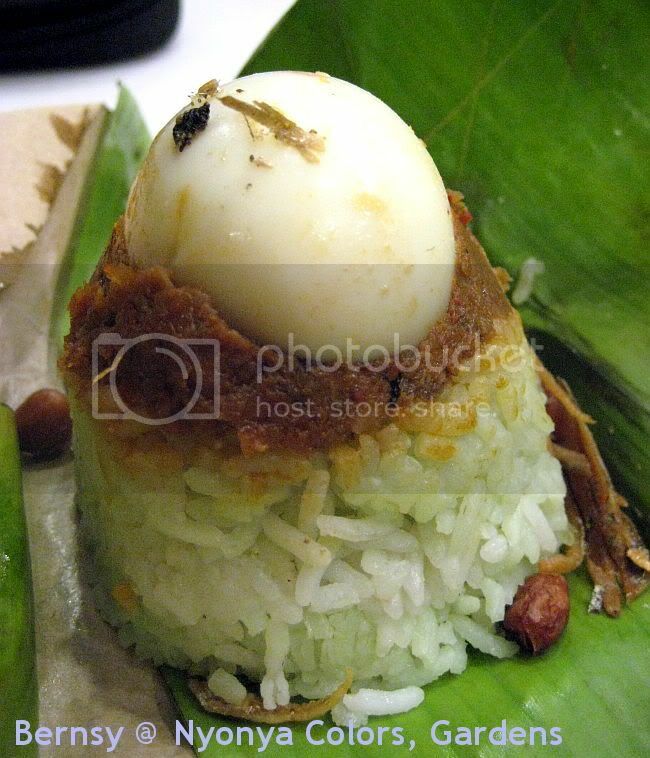 Each packet is neatly wrapped in banana leaf and waxed paper, is served with ikan bilis, fried nuts and boiled egg. 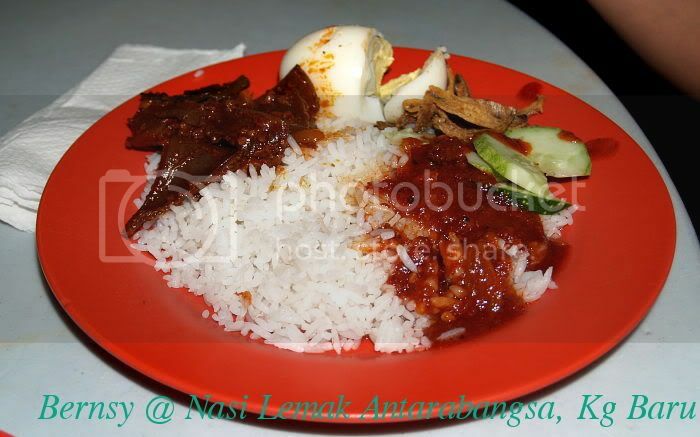 Their sambal was very nice, but believe me, they give you a different sambal when you order the Big Plate Nasi Lemak. 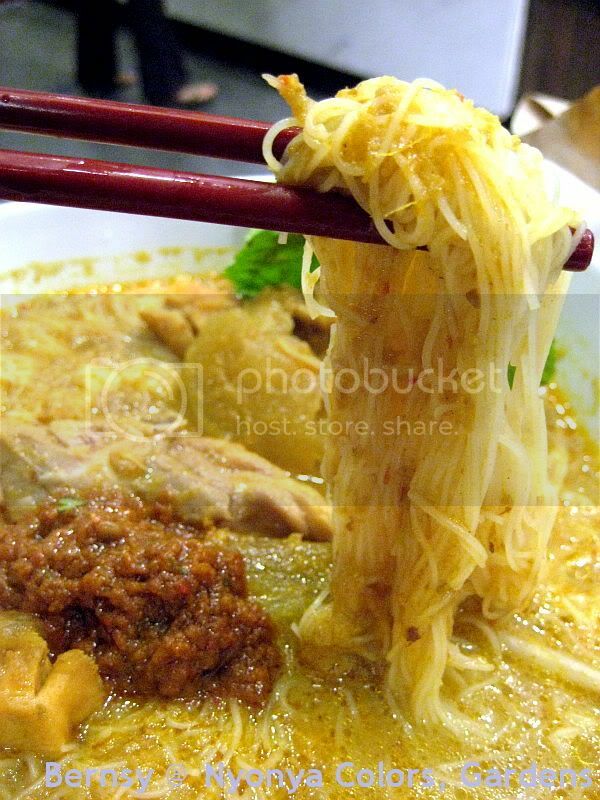 This yellow curry noodles, was what I really liked. It came with yellow curry, a little bit of sambal by the side, and the usual curry noodles ingredients, chicken, tofu pok, taugeh, etc. This one, I really recommend, very tasty bowl. We also ordered Chendol, from Nyonya Colors. I believe this is how chendol is eaten in Melaka. 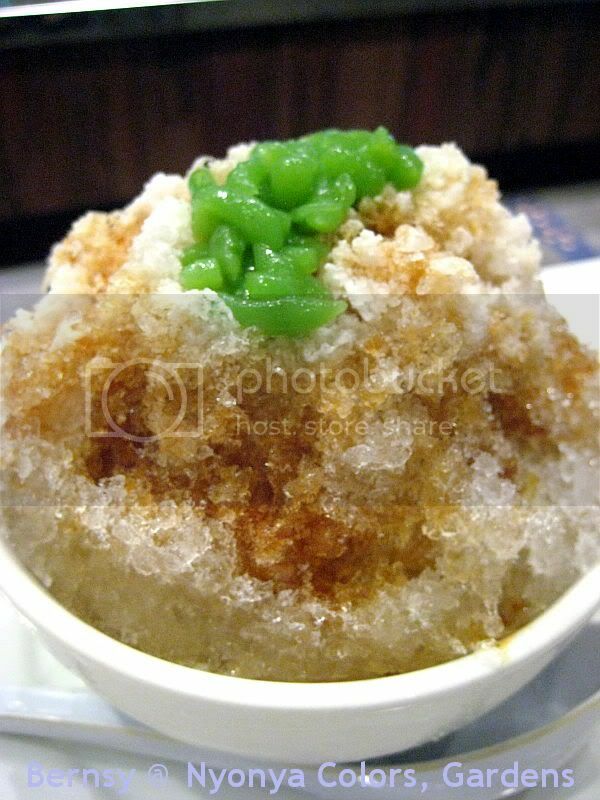 Shaved ice, chendol, two tablespoons of gula melaka and two scoops of santan milk. Gardens, Level LG Food court area. The line was long, I had to wait 15 minutes before the guy came over and help me with my order. I took me another 10 minutes to line up to pay. Overall, we had to wait a total 20 odd minutes. I remember reading a comparison review from either Malaysian Today, or Yellow Post, of the three main donut players in Malaysia, JCO, Big Apple and Dunkin. 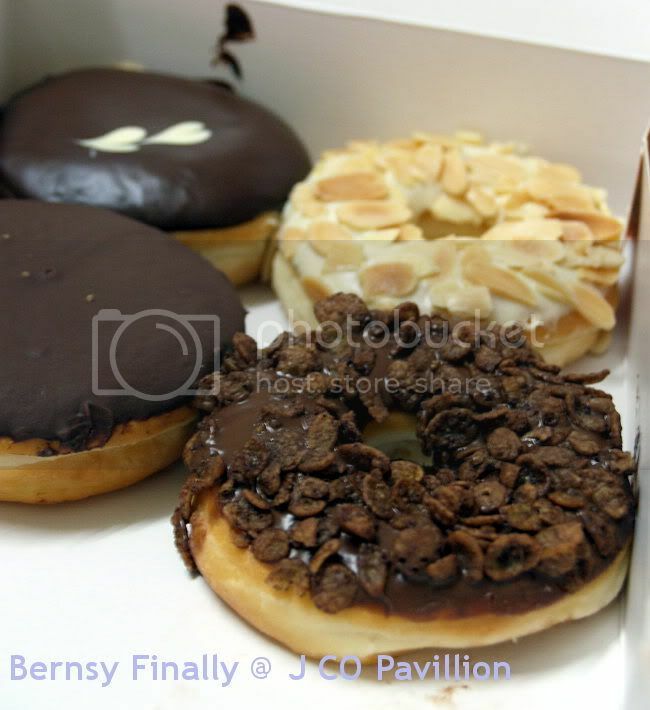 So after finally having gone through the Q, after tapauing for myself, I think J CO really does make the better donuts, as compared with Big Apple. ( I think Dunkin Donutz simply aint in the same league as these two now). I remembered when I read the first flogger's post on an eatery at the Pavillion, hundreds or perhaps thousands have followed since. Upon reading them food reviews, I couldn't really motivate myself to make the trip down to KL, especially to that area, where traffic jams, are a norm. Sayang works Saturdays, and first halves of the Sunday is dedicated to church, and the later half is dedicated to buying stuff for the new house and all, time is definitely not on our side. Luckilly for us, we somehow managed to make a few changes to our usual schedule, and squeezed a little time out to do a family lunch... @ the Pavillion. Upon arriving at the Pavillion we were pleasantly surprised to find that traffic was not that bad after all, and we did not have to circle the car park for 20 minutes before getting into a space which is very common at places like the Curve, 1U, MidValley, and I believe parking spaces are scarce even at places like Leisure Mall. 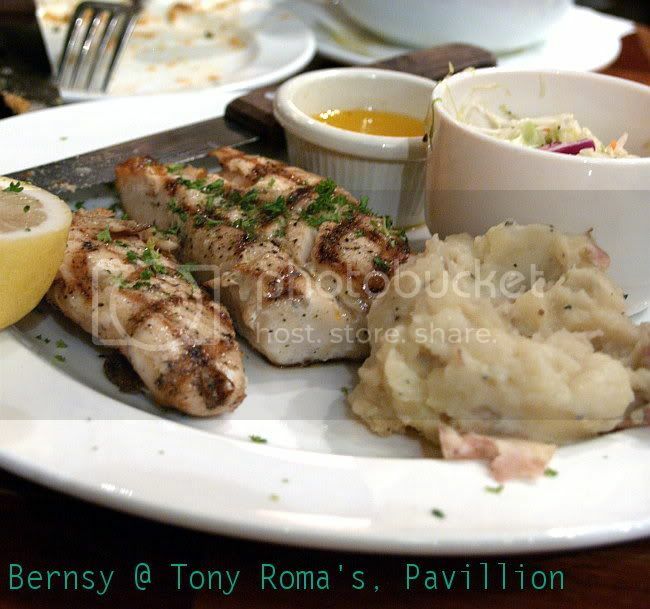 He headed down to the basement where the famous Food Republic was, and we decided to go try out Tony Roma's. MIL and FIL both have not tried Tony Roma's before, so they agreed to try out. This bowl of soup was just great, as it had lots of ingredients in it. 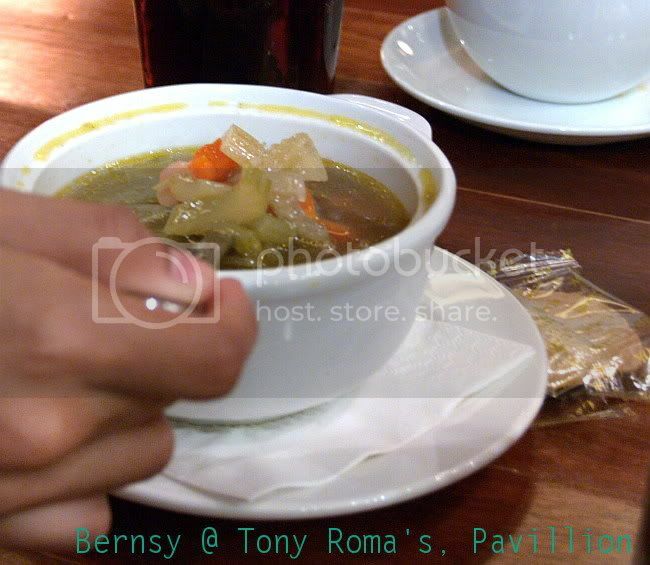 It has every feel of a home cooked soup, in every spoonful of soup you put in your mouth. This appetizer, seems to appear in everyone's blog for some reason. My theory is that, the Onion Rings were being sold excessively by Roma's staff. 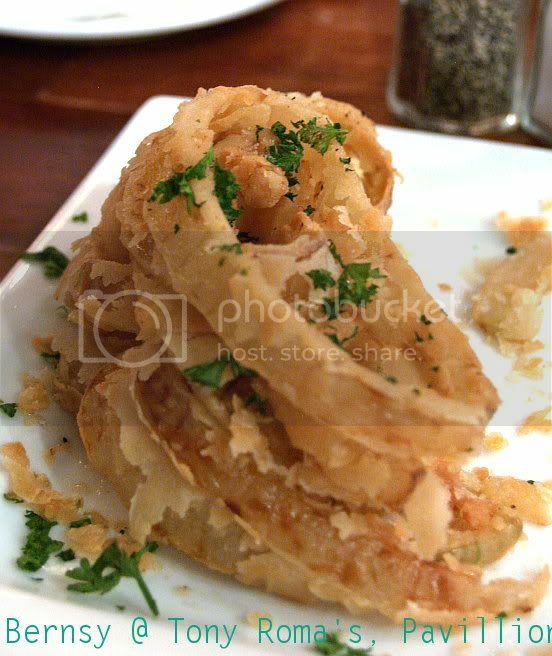 On one hand I thought its a good appetizer, on the other hand, its just simple onion cut in rings, dipped in batter and dip(pardon my American spelling) fried. Cannot be simpler than this. Needed more seasoning, so when it arrived I took one onion ring neat, then the rest I dipped into chilli sauce... yummy !! Sayang as usual was on her weight loss diet. 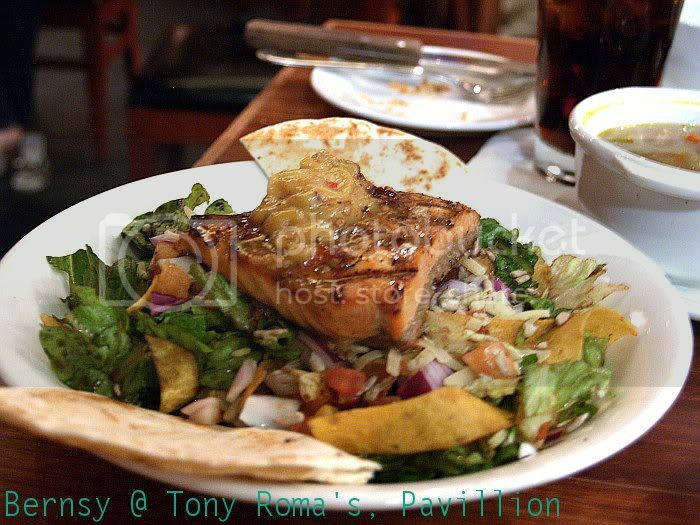 She was going to have salad, and looking into the menu, the most ideal salad to have (if you are thinking about weight loss) was this Salmon or Tuna(grilled), Salad, that comes with the standard leaves, onions, I think they sprinkled a little bit of mozarella (kedekutnye), tortilla chips. The salad's tossed in a mix of Olive oil, balsamic vinegar, and a squeeze of lemon juice. As a filler, two pieces of pita bread is also put at the side (capatee looking bread). FIL, pulak ordered this grilled chicken, which comes with a generous portion of grilled chicken meat, a large scoop of chunky mash potatoes, coleslaw with honey mustard dressing. I think both mother and father in laws had the same dish. Since no one eats beefy in the family I only get to eat them outside. Surely I will order my favourite item, burger. 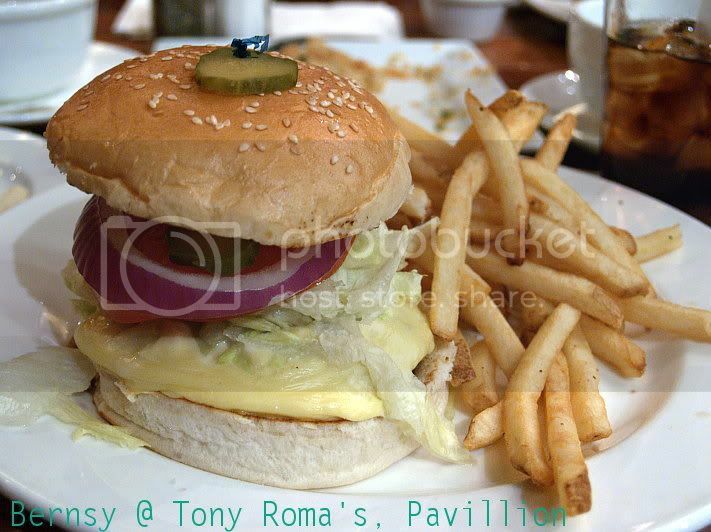 This is the Roma's Burger, it comes with beef patty cooked to well done, and wrapped in two slices of cheddar. On the side, half a plate of freshly fried french fries. I am seriously not going to compare this burger with Carl's, Burger King, Wendy's or McDs. This one is a real burger with real fries, and the best accompanied with a mug of cold beer, not soft drinks. To cap of a wonderful lunch outing, I added this last minute order after everyone was waiting for the food to settle, I asked for the Avalanche. We were already stuffed by then, but the avalanche just looked so irresistible. 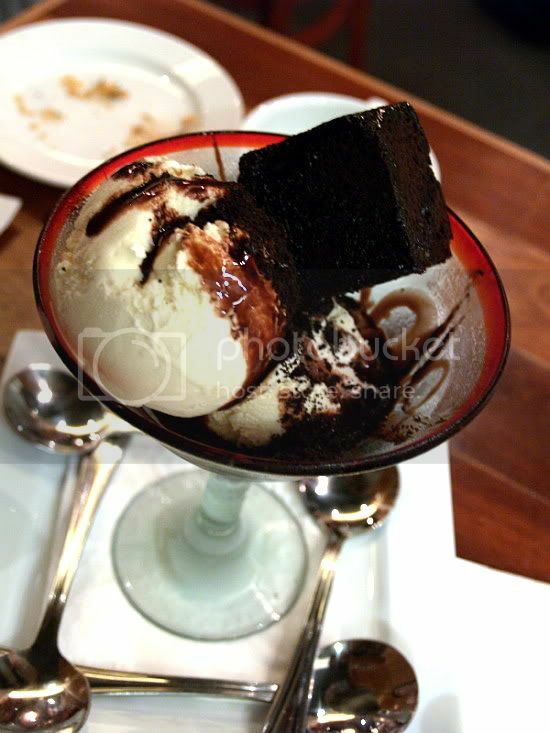 Althought it was just two scoops of Vanilla ice cream, with a brownie on top, the chocolate syrup they put on it, completed this amazingly simple and delicious dessert. 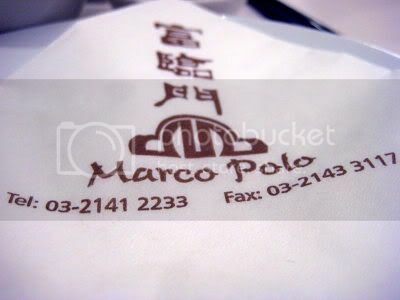 I remember when I was a small kid, my grandpa used to his birthday dinner at Marco Polo. Without fail, he will book a room with two tables, and have everyone come down to town in the middle of the famous Chulan Jam (nope its not a Les Mill special, you really get stuck in Raja Chulan for 30 mins without moving). In the past 3 months, it has been a monthly affair, the coming down to KL to have dinner at Marco Polo, thing. For one, the promotion makes it very worth it to have dinner before having to get stuck in the jam outside before going home. The promo goes like this 68 ++ for 4 dishes, 18++ for additional ones. 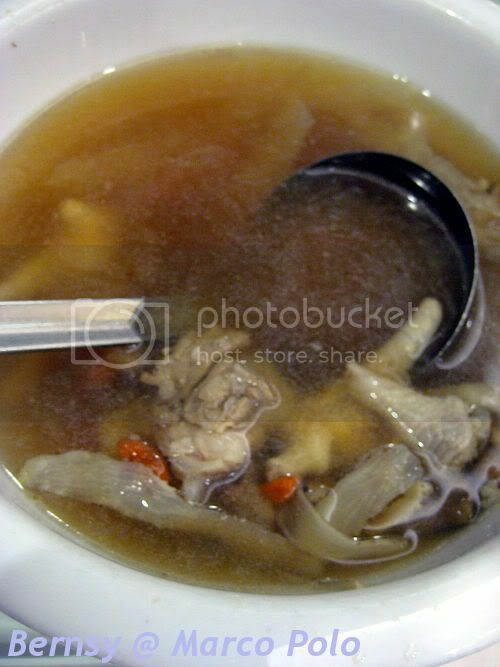 First up was a herbal chicken soup. Nice, the soup was boiled sufficiently long enough for the chicken stock to bond with herbs. Pineapple Pork Ribs, were succulent and juicy. The vegetables were crunchy and fresh, ribs tender. Its a small portion, with about 6-7 pieces of 2.5 inches ribs, stirfried with sweet and sour sauce, and crunchy vegetables. 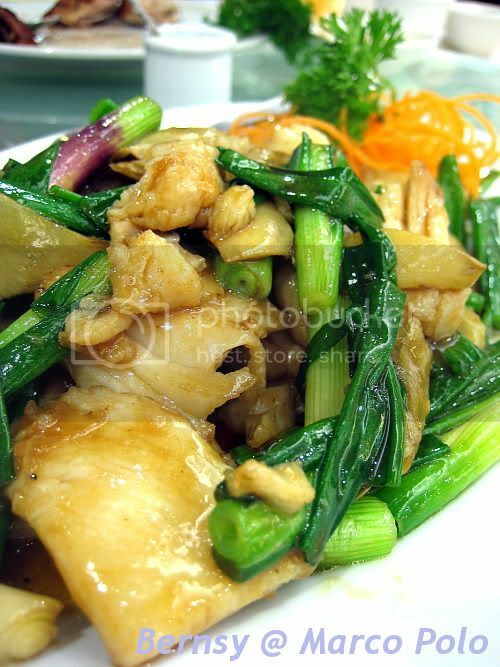 Fried fish paste with garlic and ginger. This dish had a generous serving of fish paste. A bit too salty for my liking that night, really have to tell the captain to ask the cooks to take it easy on the salt. The roast duck was excellent. The skin was cripsy , and duck meat juicy. Again, another fast food item available in Marco Polo. 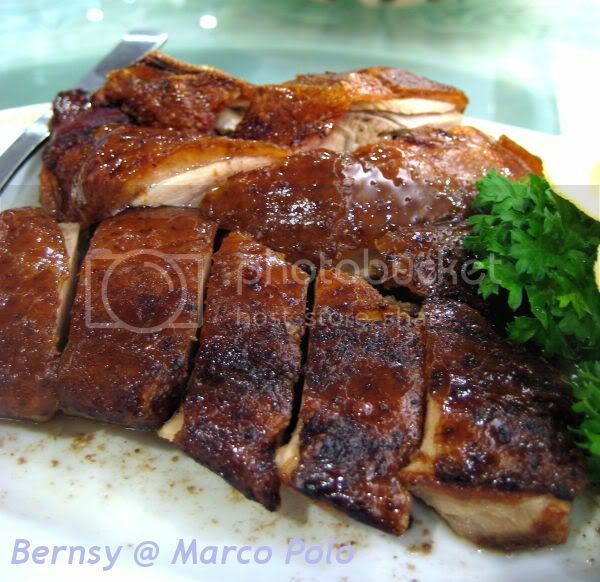 Although they are not famous for char siu or siu yoke, after testing their duck and chicken roasts, I think their kung fu for roasted meat (siu lap) can be quite good. Their ginger steamed telapia was a disappointment. Nothing wrong with the way they cooked it, but the fish was quite horrible. 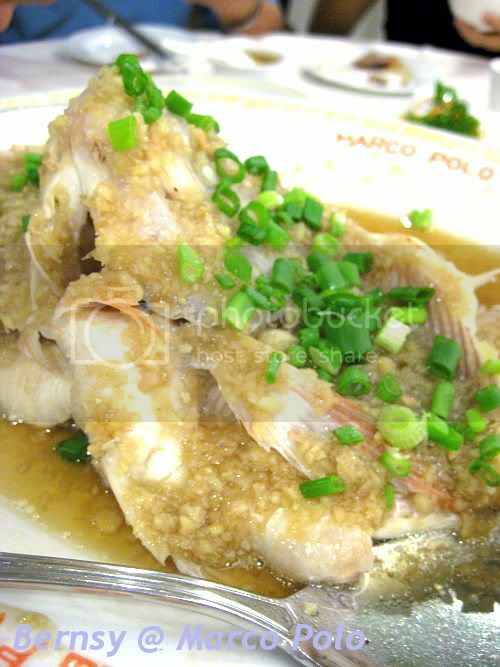 We will never order this fish again, but for Rm18++ its blardy cheap to have in Marco Polo. Finally some greens. 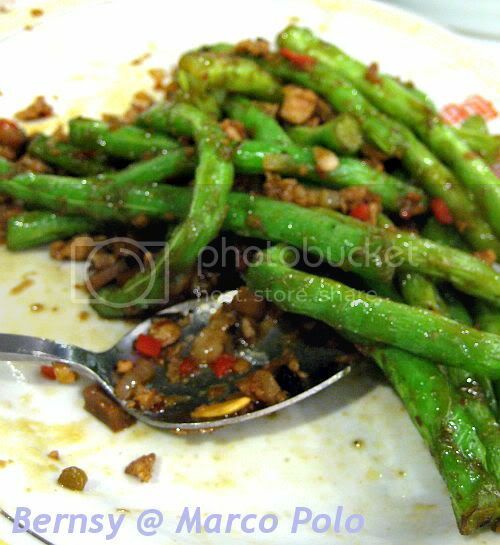 This is fried asparagus, with dried shrimp, and chilli. This was one of the best dishes we had that night, lovely. 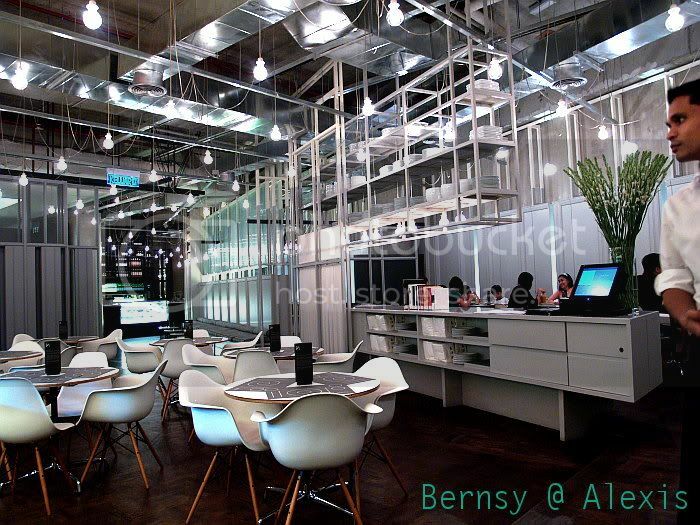 Anyways, it is just ironic, now we have also chosen to have our Wedding dinner at this place. 6 months ago, when we got married, we had no idea where our dinner will be held, in fact, if we could have it our way, we would have opted to have the Wedding Dinner function, maybe in about a year or two. Parents will always parents, they insisted that we organize the wedding dinner ASAP. Actually they already had something in mind, and when they say that we should organize, it meant they will do the stuff. 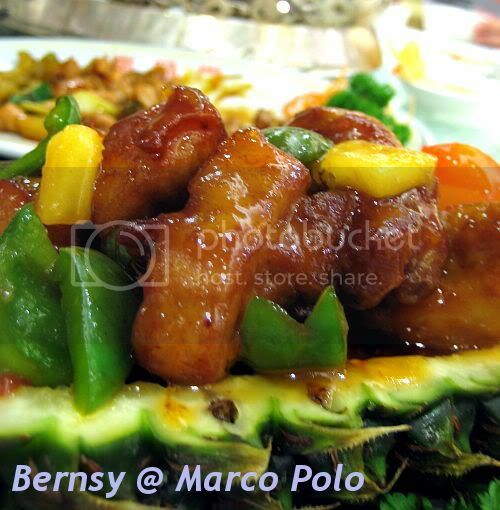 As such, we have been going to Marco Polo very often these past few months, and in this review, we had this like 2 months ago. Marco Polo is having a very attractive promotion right now, and it has been running since February (after CNY). A set dinner of 4 dishes, for 4 pax, goes for 68++. 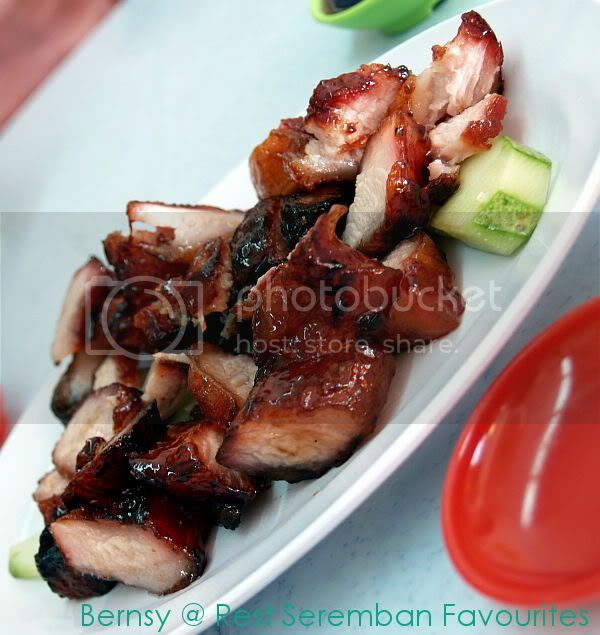 Additional dishes come at Rm18 ++ each. Tidbits, towels, are additional of course. Their sweet and sour pork was nice. 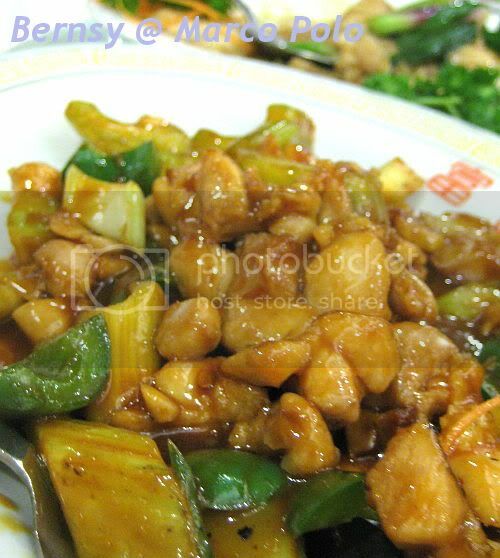 Just like most hotels, their "gu lou yuk" is stir fried with the usual capsicums, tomato, pineapples, and stawberries. Yumm... nice, sweetish and sourish. 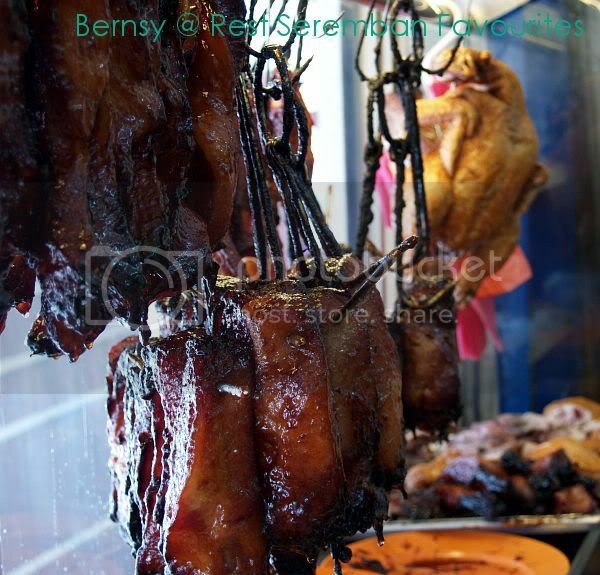 Plus the pork they use, are of pretty good quality ones, its tender, juicy on the inside, and crispy on the outside. Their roast chicken tasted quite nice and crispy, although I suspect that their roast chicken is a fast food item. 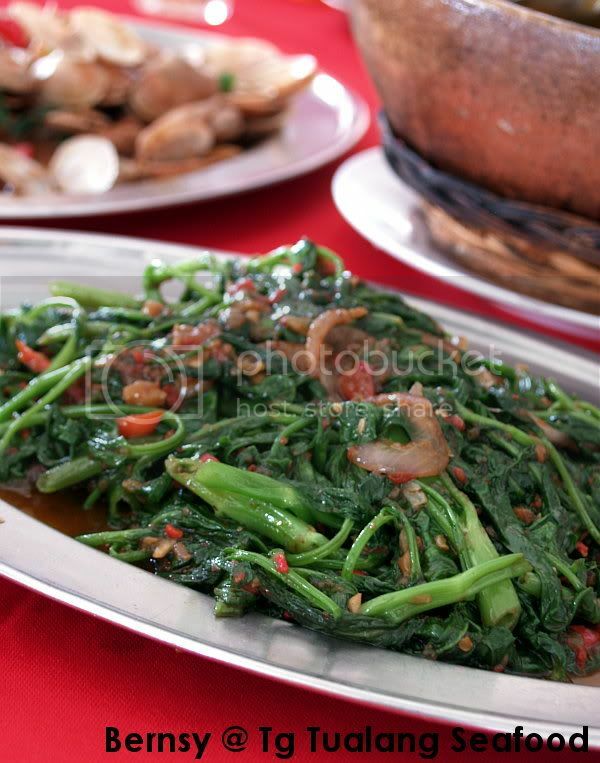 Ready cooked, just chop and serve type of dish. The skin is cripsy, and meat moist. Marco Polo Restaurant Sdn. Bhd. Siu V - dinner very "tai sek"
This time around, we wanted to try different stuff. 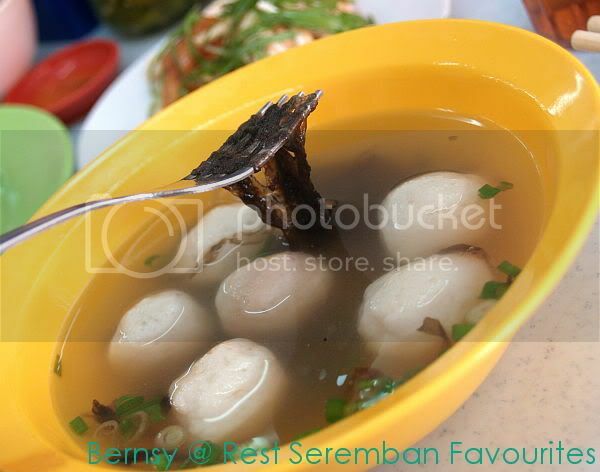 Like this teochew fishballs. Very springy, and tasted like pretty good fishballs. No complains. This was what I ordered. Teochew fishball noodles, which I thought was rather simple. Its clear soup is simple, not heavily laden by MSG, plus he puts in that little bit of sea weed to add that little kick into the clear soup. The fishballs were springy, making it a pretty good eating experience. 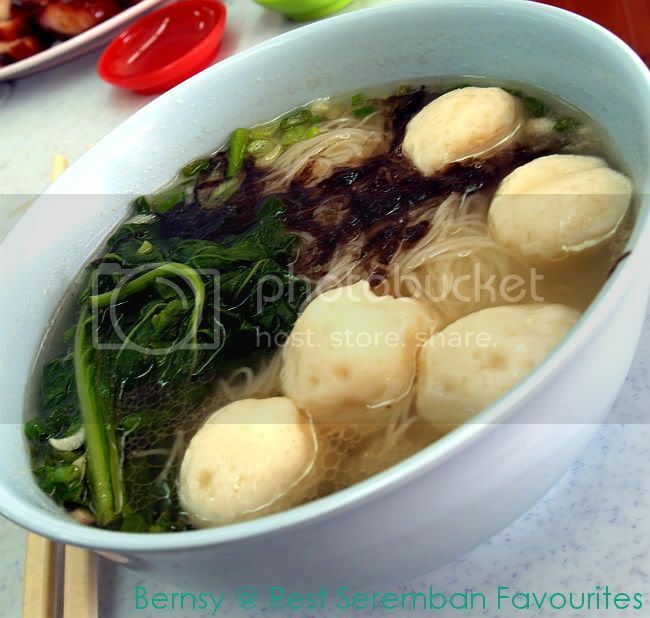 Otherwise, its just another bowl of beehoon soup, with springy fishballs, and seaweed. 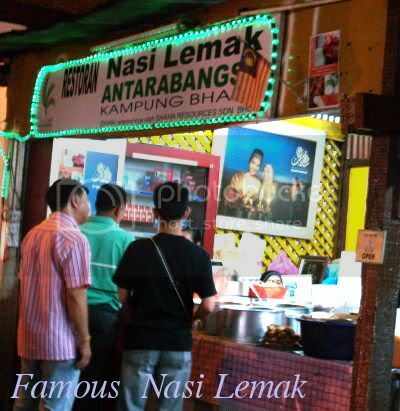 One of those places, which I always think of when someone mentions "Nasi Lemak", its gotta be this stall in Kg Baru. The stall has not changed locations albeit a major renovation to the entrance of this Kg Baru food enclave. 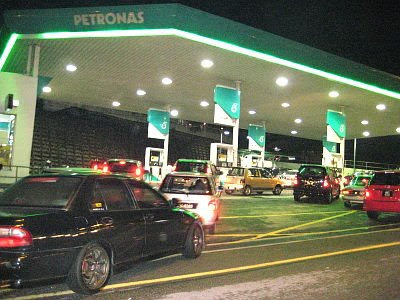 Its located a shorts drive past the pintu gerbang at Kampung Baru, and since the renovation, there has been plenty of new car park spaces,. I do not have the exact information as to how long this stall been around, but the first time I was brought to this stall in 1993, it was already famous. If you do not want to eat rice, they sell fried beehon, and fried noodles. Sayang and I will usually eat here while driving around town looking for a place to eat. She normally goes for a small amount of rice, some sotong sambal which to her is nice, and a little bit of their sambal. 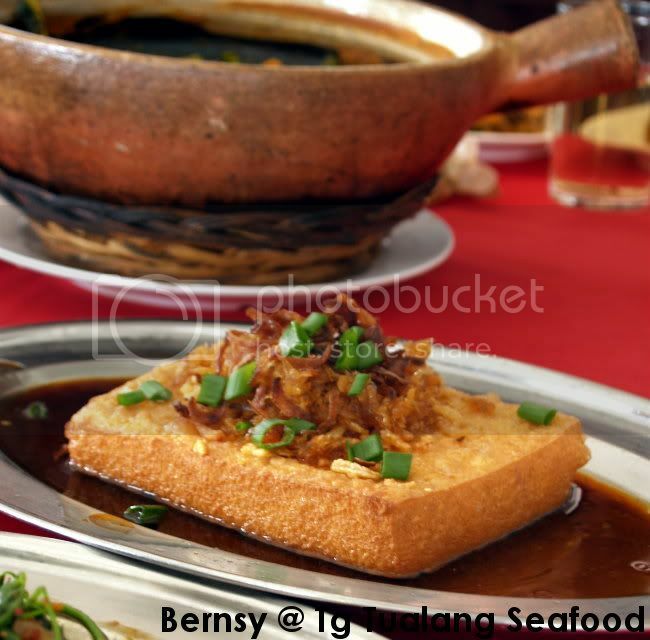 For me I usually go for either Chicken or beef rendang, and the paru goreng, is a must have. I think some people don like the idea of eating the paru , but its nice. If you think thats weird, some of these tom yam stalls around Kg Baru actually sells, lidah goreng.... now thats something you don't get to eat everyday. Why I like this stall ? It has a limited number of dishes, which means they get to control the quality of food as well as their supplier of ingredients. Their taste of their sambal is just out of this world, something I would use as a benchmark to compare other nasi lemak with. 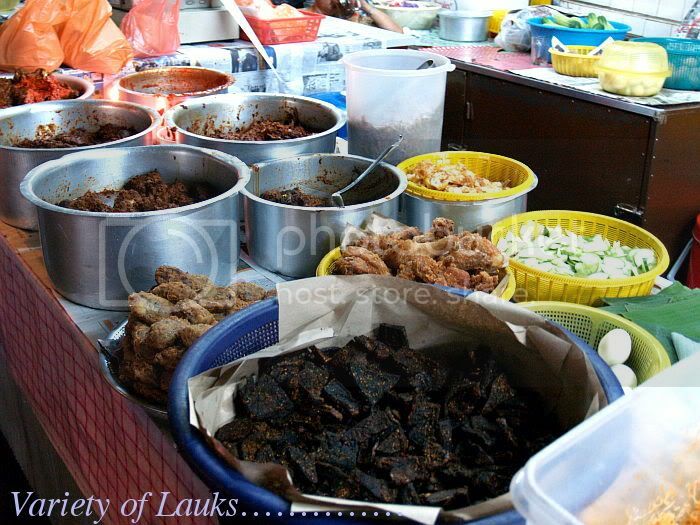 The stall is now an icon, in Kg Baru. But their prices are still down to earth if you ask me. 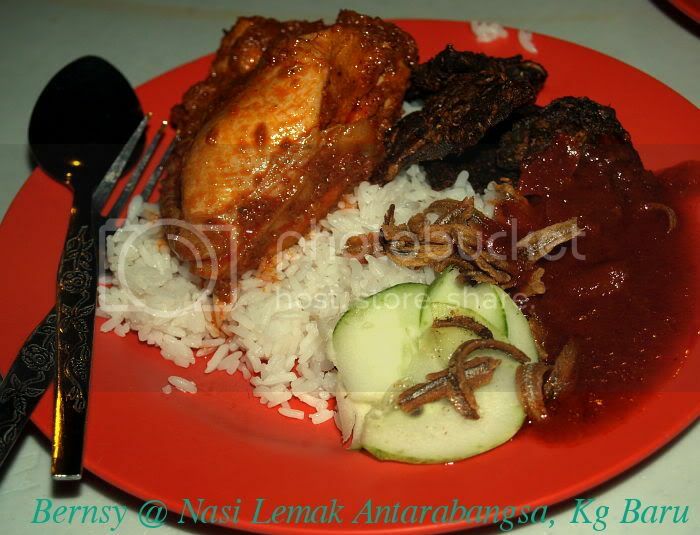 Their nasi lemak should not be compared with those at Sakura, Imbi or Madam Kwans which is priced differently hence, different ingredients used. 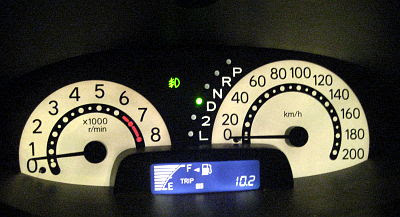 By 6pm, my phone had already been flooded by SMS from concerned friends and family of the bloody increase in petrol. 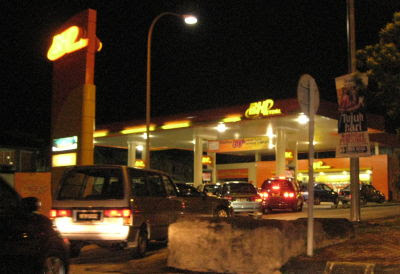 At 4, I was still living in denial, not believing that the price of petrol can actually increase to about 2.70. So at 6 something I dropped by the next Shell Station I could see, and filled up an empty tank with VPower... after why not, its time to give the car a little treat which might not come by anytime soon after such drastic price increases. 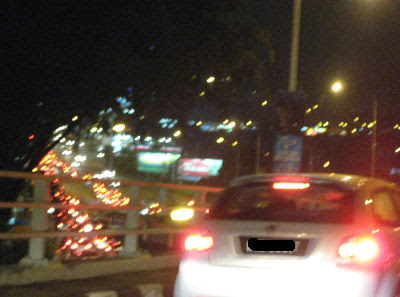 We left MidValley and had to crawl through this congestion... and for what ???? Because everyone's gonna fill up their tanks, last minute. We also shared a pizza. It was a large half and half thin crust pizza. Again it did not impress very much, it was for Rm28++. 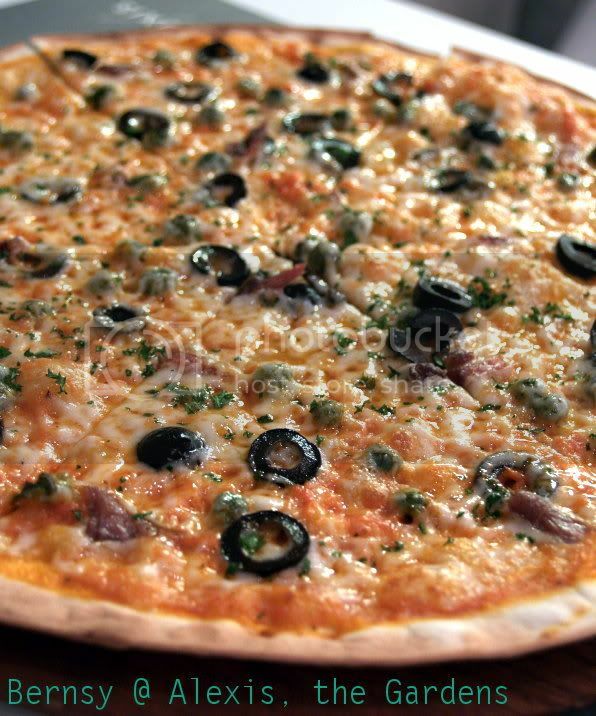 However, it must have gone down to the decision of ordering some pizza with lots of olives. It had quite abit of olives, a thin layer of tomato base, shrimps and oysters. Ingredients were no doubt fresh, the cheese was nice, but we didn't really liked it. On a special note, I thought their thin crust tastes like bread cracker. Nice and crunchy. This was my first visit to Tanjung Tualang , located on the outskirts of Ipoh. We went back MIL's hometown to do the annual ching ming thingy, so I tagged along. Everything finished by 11am and we went back to Sayang's uncle punya rumah to rest abit before they brought us to Tanjung Tualang to have seafood. 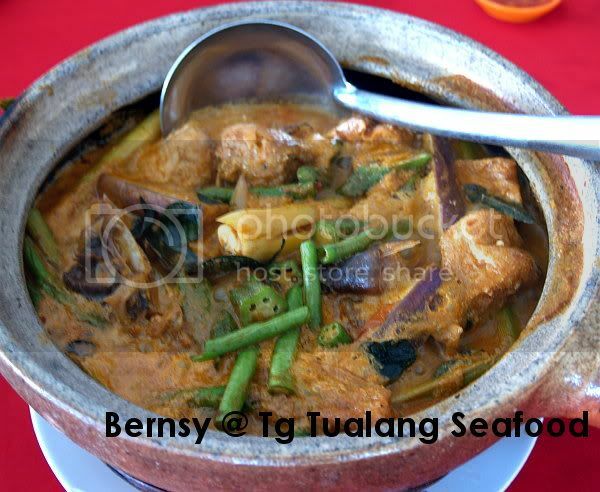 There are so many Seafood restaurant at Tanjung Tualang, we actually went to the one, situated below a Persatuan Hokkien. 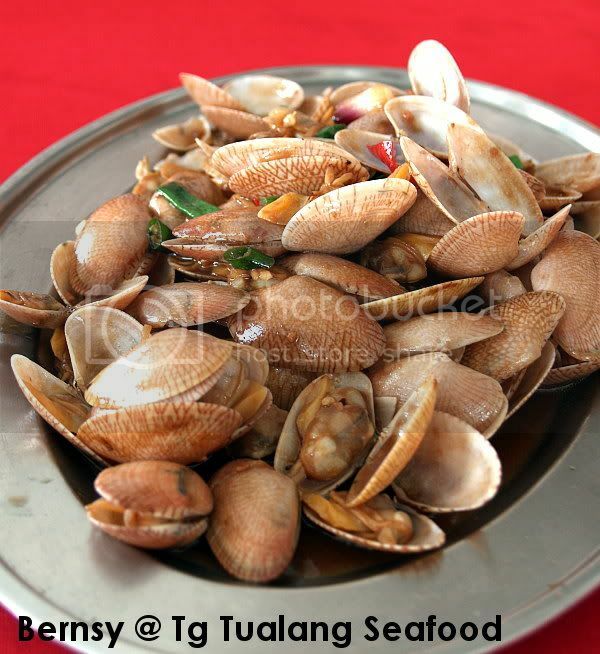 Tanjung Tualang is a small town but when it comes to their La La, there is nothing small about it. The Fried lala came and I dugged in, everything in there fresh and doesn't smell funny. That's like a plus point for anyone who loves lala. Most of their lala are cooked and is open. This is a version of their Fried tofu, which was quite simple. Crispy on the outside, and soft and white on the inside. A vegetarian curry pot, with fresh crunchy vegs. Fried Lai liu Har.... and their sweet and sourish dip. 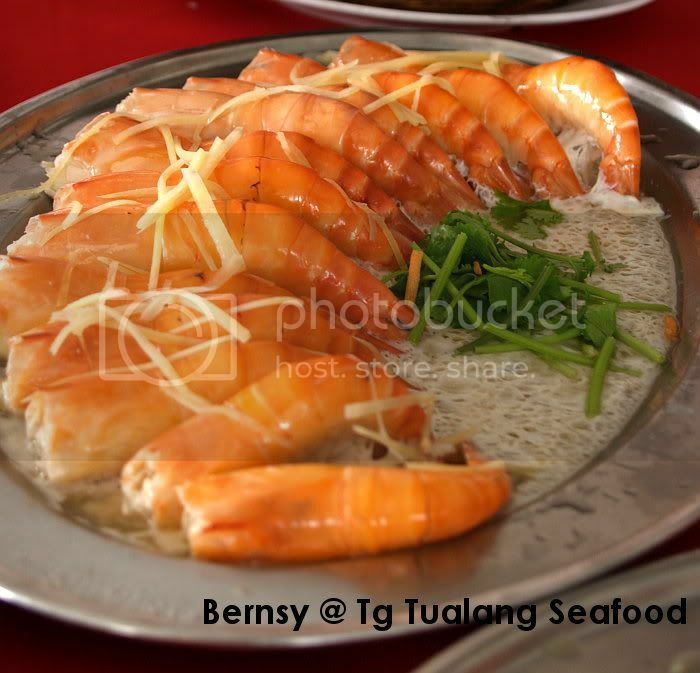 Their Signature Steamed Fresh Water Prawns. The lunch was very nice. We had a lot to eat, the servings were very very generous. The seafood was all super fresh as if, just caught and cooked on the spot. The lala was clean, no smell, the prawns were tangy and fresh. Even the vegetables were nicer than those found locally here in KL. So after lunch we drove back to KL via the coastal road, which took us an additional 2 hours to get back. Very tiring to drive, but the little towns we passed provided much needed entertainment during the drive.